In my last post, I talked about Robert Jordan’s epic fantasy series, The Wheel of Time, and what it meant to me personally, but I didn’t go into much detail about the subject matter of the series itself. In brief, in the series’ fictional mythology, a deity known as the Creator forged the Universe, and in doing so created the Wheel of Time, which, as it turns, causes events to repeat themselves, most notably the breaking of the world. Mr. Jordan apparently borrowed the concept from Hindu mythology, and I’m sure several other cultures and religions share similar myths, but I have long thought, even before I started reading the series, that there may be some truth to the concept, at least from the standpoint of cosmology. Everyone is familiar with the big bang theory (the actual theory, not the TV show). It’s the prevailing cosmological model for the formation of our universe, stating that roughly 13.8 billion years ago, the entire universe, at the time a hot, dense ball of matter, suddenly exploded outward with great force and began to expand rapidly. Hubble’s observations in 1929 that all objects in the universe are receding from one another supported this theory, as have other observations since, such as the discovery of cosmic microwave background radiation in 1964. But the big bang theory does nothing to explain why the universe was in a hot, dense ball to begin with. Where did the matter come from? Why was it there? Did the big bang mark the beginning of time? Could something as fundamental as time even have a beginning? In The Wheel of Time, author Robert Jordan starts each book with a description of an event, mentioning that the event was not the beginning, as there are neither beginnings nor endings to the Wheel of Time, but it was rather a beginning. What if our universe behaved in the same manner? Wouldn’t it perhaps make more sense if time, and our entire universe in fact, were cyclical rather than finite? The idea that the universe might follow infinite self-sustaining cycles is not new. In the 1920’s and 30’s, a number of theoretical physicists, including Albert Einstein, considered a theory where time is infinite, and each universe begins with a big bang and ends in a big crunch, a big crunch being where the universe collapses back into a singularity under the weight of its own gravitational attraction. This is a very attractive theory, and though Einstein and his colleagues did not know so at the time, we now have observations that support the notion that supermassive black holes exist at the center of many galaxies (certainly there seems to be one at the center of the Milky Way). As these supermassive black holes grow, consuming galaxies, what would prevent them from growing until they consume all matter in the universe, creating a big crunch? Well one reason, postulated in 1934 by Richard C. Tolman, was that according to the 2nd law of thermodynamics, each successive cycle would increase the entropy of the universe, and so eventually the universe would die a heat death, making it not, in fact, infinite. 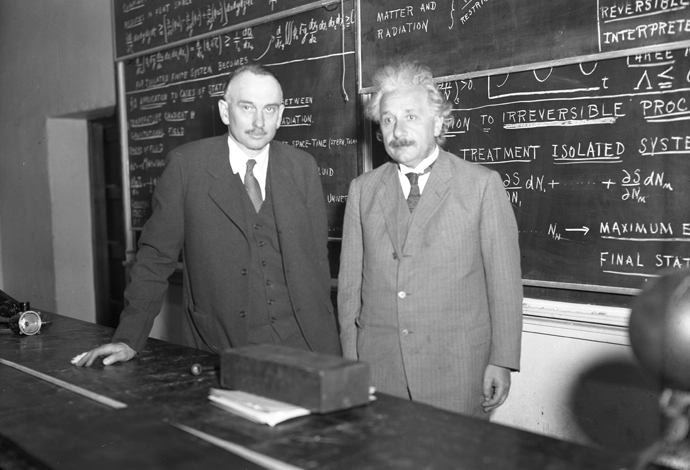 Richard Tolman and Albert Einstein, 1932. Well, end of that theory. You can’t argue with the 2nd law of thermodynamics. After all, it’s a law, right? Wrong. The entire scientific method is predicated upon the idea that we form theories based upon the best knowledge available to us, and while the 2nd law of thermodynamics has yet to lead us astray, it’s not beyond the realm of possibility to think that the laws of thermodynamics might break down when the entire mass of the universe is condensed down to a single point. Enter the discovery of dark energy and new cosmological models. The Steinhardt-Turok model essentially postulates that entropy buildup could be avoided by having a net expansion of the universe each cycle, and the Baum-Frampton model, proposed in 2007, proposes that in the fraction of a second before a big bang, all mass and energy in the universe is converted to dark energy, resulting in the elimination of all entropy. Honestly, I don’t fully understand these models (I’m not sure anyone does). But the discovery of dark energy at least gives some credence to the idea that cyclical models of the universe are still feasible. Then there’s those that take the concepts of cyclicality to bizarre extremes, like the controversial Peter Lynds, who theorized (or maybe just made up) an idea where not only is time and the existence of universes cyclical, but events play out exactly the same way in each cycle. To me, this departs from the realm of physics and enters the realm of fantasy, but who really knows. Scientific arguments aside, I think the idea of a cyclical, infinite universe where time has and always will exist makes more fundamental sense to me than the alternative, but what about you? Do you think the universe had a finite beginning, or is it more like a Wheel of Time? Was the birth of our universe the beginning, or merely a beginning? Image credit: Featured image by ESO/M. Kornmesser (http://www.eso.org/public/images/eso1327a/) [CC-BY-3.0]. Post images in the public domain.